1982 Audi Coupe Ad - Named Best Sports Coupe for 80s!! 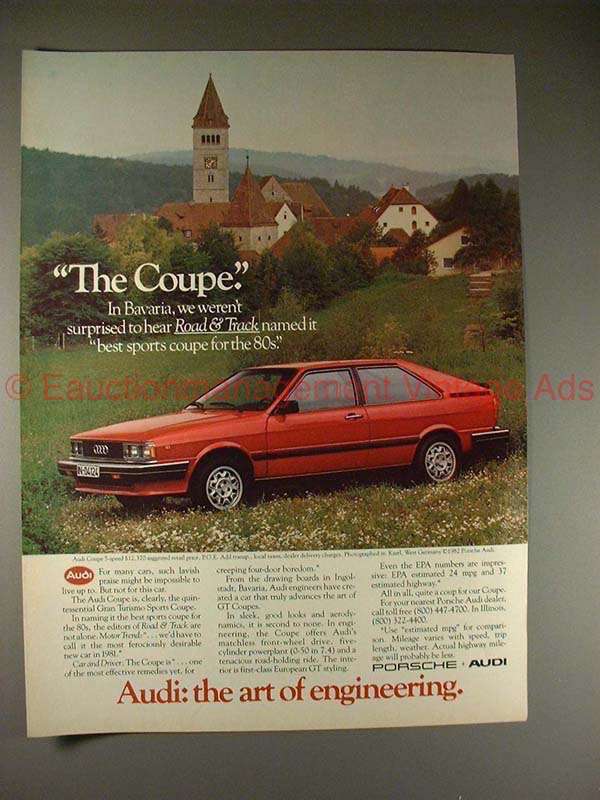 Vintage Paper Ads > Cars - Trucks > Audi > 1982 Audi Coupe Ad - Named Best Sports Coupe for 80s!! This is a 1982 ad for an Audi Coupe! The size of the ad is approximately 8.5x11 inches. The caption for this ad is "The Coupe in Bavaria we weren't surprised to hear Road & Track named it the best sports coupe for the 80s!" The ad is in great condition! This vintage ad would look great framed and displayed! Add it to your collection today! 1980 2pg Audi 5000 Car Ad - Imagine a Diesel-Powered!! 1986 2-page Audi 100 Estate Quattro Car Ad!